We thank the Cambridge Chronicle and Tab for helping us spread the word about our Cambridge establishments helping us to raise money for the research of Dr. Shom Goel during the week of Boston Bakes for Breast Cancer May 8-14, 2017. This week, indulge in desserts, it is for a good cause. “It is a sweet and simple way to raise money for breast cancer research. We are a simple, grassroots organization working hard to make a difference,” Carol Sneider, founder and president of Bakes for Breast Cancer, said. Bakes for Breast Cancer is an annual campaign where restaurants all over New England participate by creating a special dessert as an addition to their regular dessert menu. One hundred percent of the proceeds from that dessert go to finding a cure for breast cancer. This year’s Cape & Island Bakes will take place June 6 through 12. Stop into any of the Island establishments listed below to support the cause. Détente is serving up a Blueberry Bread Pudding with caramel and elderflower lemon curd. “We’re participating because it seems that cancer touches everyone’s lives at some point, and we know that funding the research for treatment is always so difficult. Hopefully we can help by participating,” Détente’s Suzanna Crowell said. Sweet Life will participate with a slice of cheesecake with peach purée, toasted hazelnuts, and coconut crumble. The Terrace at the Charlotte Inn is creating the perfect summer dessert, with a Buttermilk Panna Cotta, Chilled Strawberry Poppy Seed Soup, and Vanilla Tuille. Copper Wok is part of the 50 Percent Club, which means they will donate 50 percent of all dessert sales for the week to the cause. Treat yourself until June 12th at any of restaurants above, because as some famous person once said, “Life is uncertain. Eat dessert first.” Follow along on social media at @Bakes4BC and #Bakes4BC. Eat dessert today through Sunday in memory of Martha’s Vineyard resident Linda Wheaton, and help raise money to battle breast cancer. After years of participating in the Boston Bakes for Breast Cancer annual event to raise money, the Cape & Islands has its own effort for the first time. The nonprofit Bakes for Breast Cancer enlists restaurants, bakeries and retail stores in more than 100 communities across Massachusetts and Rhode Island to participate. Nearly $1 million has been raised since Boston Bakes was founded in 1999 by having participants select a dessert off of the menu and donate 100 percent of sales. Some restaurants choose to donate half of all dessert sales for the week. For a list of participating restaurants, visit bakesforbreastcancer.org; follow on Facebook, Twitter (@Bakes4bc) or Pinterest. Taking inspiration from loss of a loved one, former hotel and hospitality maven Carol Brownman Sneider founded the 501c3 organization known as Bakes for Breast Cancer in memory of her mother, who succumbed to the tragic disease in 1973. This past Mother’s Day, Sneider hosted the 17th annual B4BC event in Boston and celebrated the third edition of the RI B4BC event. As she prepares for the first ever Cape & Islands Bakes for Breast Cancer June 6-12 (noting that The Cape has a 20% higher incidence rate of breast cancer than the national average), Sneider looks back with appreciation for her mother’s life and also for all that she has been able to accomplish through desserts. The events thus far have raised more than $1 million dollars, but much more is still needed. That is what keeps Sneider moving and baking. How do you define your venture? I took a horrible loss and turned it into something positive. This was meant to be my venture. For me it is important for anyone and everyone to make a difference and help in the fight against breast cancer by simply buying a dessert, taking a cooking class, holding an office bake sale, a bake sale or other events we will kick off in the future. I think my mission in life is to make a difference in the fight against breast cancer and do these events to make a difference. I know there is so much more I can do, but I am grateful for the support I have received from so many to be able to do what I do. It is my participants that make my events come to life. I am able to accomplish this through desserts. My widowed mother (an Ashkenzi Jew), passed away from breast cancer at the age of 44 in 1973 when the odds of getting breast cancer were 1 in 20, at time when no one mentioned the word cancer or breast cancer. She left behind two daughters – aged 16 and 11 years. We only found out one month before their mother’s death that she had breast cancer. In 1990, we started a Fund at Dana-Farber named in her memory. The Eva Browman Breast Cancer Fund got us into fundraising and events. By 1999, I wanted to create an event that crossed all socio-economic demographics, enabling everyone to make a difference in the fight against breast cancer. In 2011, B4BC became a nonprofit organization and, ever since, we have expanded our vision beyond this one event and have more that we would like to do to raise more money for breast cancer research. Our signature event is Boston Bakes for Breast Cancer. It takes place the week of Mother’s Day every year. It was based on memories of baking with my mother- sugar and spice and everything nice! We have grown from just holding this one event! Who is your customer base or demographic? Our demographics are endless. Everyone knows someone touched by breast cancer. The potential for what we are doing more is limited by our imagination; There is incredible growth possible for our current events and for events in new markets. We want to grow our organization, do more and raise more money for breast cancer research. How do you hope to fit into the market? We enable everyone to make a difference in simple, easy ways that are meant to fit into everyone’s daily lives. What do you most need to be a success? We need sponsors who want to help us reach new levels in new markets as well as our current markets. We also look for more participants in our events and more people to enjoy the desserts who can help make a difference for a disease that touches so many we know and love. This interview is part of Matt Robinson’s continuing set of Jewish and Israeli entrepreneur features. Treat the special women in your life to decadent desserts while also helping fight breast cancer during Rhode Island Bakes for Breast Cancer from May 8, Mother’s Day through May 14. Restaurants, bakeries, cafés, and ice cream shops throughout Rhode Island will participate in Rhode Island Bakes for Breast Cancer, including Eleven Forty Nine Restaurant, Not Your Average Joe’s and Legal Sea Foods in Warwick. 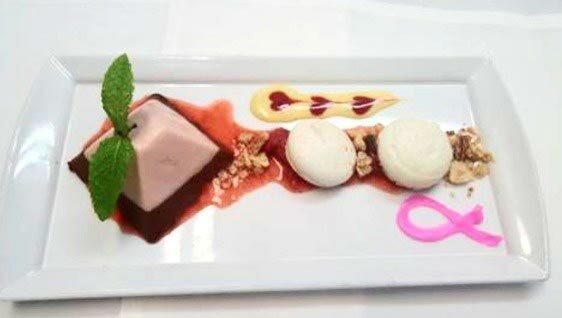 Establishments designate all sales of one specific dessert to support breast cancer care and research. Proceeds raised will benefit the nonprofit breast cancer organization Bakes for Breast Cancer. This year, we will be supporting the research of Dr. Heather Parsons at Dana-Farber Cancer Institute. Dr. Parsons research focuses on biomarkers and patient treatment. Rhode Island Bakes for Breast Cancer was founded in 2000 by Carol Brownman Sneider in memory of her mother, Eva Brownman, who lost her battle with breast cancer. Since its inception, the event has raised more than $1,000,000. For more information, a list of participating establishments, or to learn more about how to become involved in Rhode Island Bakes for Breast Cancer, visit www.bakesforbreastcancer.org/rhode-island/ follow Bakes for Breast Cancer on Facebook and Bakes for Breast Cancer on Twitter. Dessert lovers can also visit www.bakesforbreastcancer.org/rhode-island/shop-rhode-island and have a sweet treat delivered. Boston College Bakery, the University’s Baking Club and the nonprofit group Bakes for Breast Cancer teamed up for a cancer-fighting event April 27 in Chestnut Hill. “I’m hoping that this event not only raises awareness but that we give people a sweet treat while raising money at the same time,” said Boston College executive pastry chef Tim Fonseca. While this is the first time Boston College has taken part in this event, this is the 16th time for Fonseca, who participated annually in the Boston Bakes for Breast Cancer initiative during his 15 years as executive pastry chef at the Four Seasons Hotel. Fonseca’s late grandmother, Lucy, was a 20-year breast cancer survivor. The Boston College Bakery and Boston College Baking Club held a bake sale of pink cupcakes at various locations throughout the University community, will proceeds benefiting breast cancer research and care. Members of the Boston College Baking Club worked with BC Dining Services Executive Pastry Chef Tim Fonseca to hold the University’s first cupcake fundraiser with the national non-profit Bakes for Breast Cancer. Five hundred of the pink-frosted treats were purchased for the cause on April 27 at various campus locations, with proceeds benefiting the Dana Farber Foundation for Breast Cancer. Fonseca had participated in the annual Boston Bakes for Breast Cancer initiative during his 16 years as executive pastry chef at the Four Seasons Hotel, prior to joining BC. His grandmother, a 20-year breast cancer survivor, was the 2009 Boston Bakes honoree. “It was around the time when I was 17 or 18 and she was recovering from breast cancer that I made a strong commitment as a young adult to get to know my grandmother,” Fonseca said in an interview with The Pastry Channel that year. “In turn, we forged a friendship and a bond that really grew. “My baking genes and my cooking genes come from my grandmother,” he said. Go behind the scenes at this frosting fest in our photo gallery; read more about Tim Fonesca in the Boston College Chronicle. Monday, May 2 to Sunday, May 8: Boston Bakes for Breast Cancer. For the 17th annual year, restaurants and bakeries throughout Boston and beyond will band together for this special series that supports breast cancer education, research and awareness. The idea is simple: Each participating spot will donate 100 percent of sales from one designated dish, or 50 percent of sales from their entire dessert menu, to the work of Dana-Farber. There are about 300 places on board, including Deuxave, home to must-know pastry chef Shaun Velez (pictured, who is also serving as the spokesperson for this year’s Boston Bakes). Other options include Farmstead Table, Harvest Restaurant, Ostra and Yvonne’s, to name just a few. Find the full (still-growing) list here. We are proud to have the pleasure of having Michelle Nigro work with us on Bakes for Breast Cancer. We are honored that she chose us as her platform for Miss Cambridge pageant and now the Miss Massachusetts pageant. We wish Michelle all the best this weekend during the pageant. We know there are great things in Michelle’s future and glad we are a part of her present. Michelle Nigro is no stranger to the spotlight, having competed in pageants since age 10. But later this month the Swampscott native will take the stage in the state’s biggest pageant competing for Miss Massachusetts. Nigro, 24, is a 2008 graduate of Swampscott High and a recent graduate of Emerson College’s Broadcast Journalism program. A three-time competitor of the Miss Cambridge contest and this year’s winner this year, this is the first Miss Massachusetts competition for Nigro. She sees the larger competition as a good chance to help spread the word about her platform, Bakes for Breast Cancer, an organization which raises money through baked goods for the Dana Farber Cancer Research Institute. After many celebrated years of raising funds for breast cancer research in Boston one sweet treat at a time, Boston Bakes for Breast Cancer has finally made its way to the Ocean State with the creation of Rhode Island Bakes for Breast Cancer. Honoring mom today on Mother’s Day is a piece of cake. Whether it’s re-creating a treasured treat or whipping up a simple nibble, pastry chefs involved with Boston Bakes for Breast Cancer say it’s the thought that counts. For Mariposa Bakery’s Suzanne Mermelstein, that is especially true. “I was so young when she died, I never did anything personal to memorialize her,” said Mermelstein, who was 9 when her mother, Ella Mermelstein, passed away from breast cancer at age 34. Ella is Boston Bakes’ honoree this year, giving the Central Square baker the opportunity to celebrate her mother’s memory. Mermelstein has re-created her mother’s trademark cheesecake to benefit the Dana-Farber Cancer Institute for the weeklong fundraiser, ending today. Read more. Seven Beacon Hill establishments are taking part in the 15th annual Boston Bakes for Breast Cancer to support the fight against the disease. Participating establishments include Beacon Hill Hotel & Bistro, Figs, Mooo…, No. 9 Park, Scampo, the Tip Tap Room and Whole Foods Market at Charles River Plaza. Establishments have the option to designate all sales of one specific dessert or 50 percent of proceeds from their entire dessert menu to support breast cancer care and research. Proceeds will be shared by Dana-Farber Cancer Institute and Bakes for Breast Cancer, Inc., a non-profit breast cancer organization dedicated to making a difference. Nonprofit Boston Bakes for Breast Cancer celebrates its 15th year raising funds for cancer research, May 5 to 11. The event has grown from 42 restaurants, bakeries and supermarkets in its first year, to nearly 270 establishments in 90 Bay State communities. Each eatery donates profits from the sale of a dessert, or 50 percent of profits from its dessert menu, to benefit the Dana-Farber Cancer Institute and Boston Bakes for Breast Cancer Inc. Last year the charity raised nearly $80,000. Read more. Carol Browman Sneider has a sweet tooth. Whether it’s chocolate or fruit filled, ice cream or cake, Sneider loves them all. There’s not a dessert she wouldn’t try, a sweet she doesn’t love. So when the Needham resident wanted to raise money for breast cancer research in honor of her mother’s memory, including desserts in her campaign was the obvious choice. Read more. Click here to read more about how North End restauranteur Nick Varano remembers a friend from the old neighborhood during Boston Bakes for Breast Cancer. Click here to read the Boston Herald article about Bakes for Breast Cancer from December 11th, 2012. Boston Bakes was number one in the state for giving the most money raised from an event to the cause they support breast cancer. Click here to read about Boston Bakes 2012. No. 9 Park’s Barbara Lynch and pastry chef Jaime Davis were in the kitchen getting ready. Click here to read about Boston Bakes 2011 Blue Ginger’s Ming Tsai and Pastry Chef Michele Fadden get ready for Boston Bakes for Breast Cancer with their fantastic yuzu fritters with pink peppercorn ice cream and rhubarb-cucumber shooters. Boston Globe article about Boston Bakes for Breast Cancer 2007 which was dedicated to the memory of Wendy English, sister of celebrity chef Todd English.